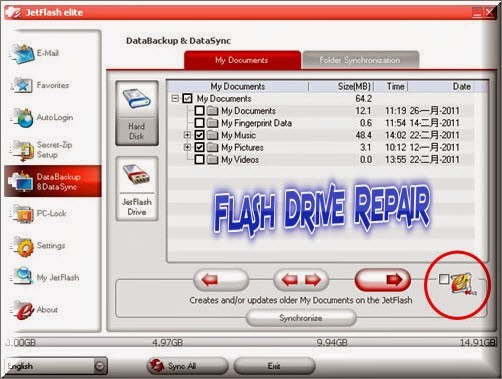 Do you have Jet Flash or Transcend Flash ?.Do you want to backup your data from Transcend flash drive .Download Jet Flash and Transcend Elite Data Backup Tool and backup your files now . 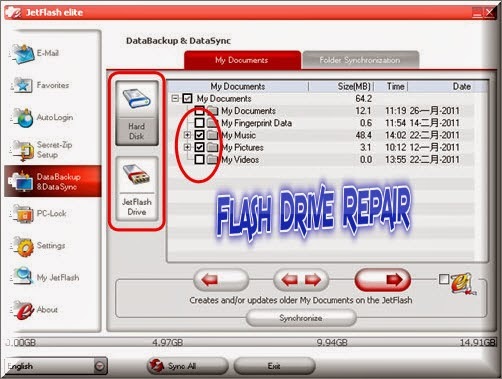 Jet Flash and Transcend Elite Data Backup is a great Backup tool for save your data .This tool allows you to copy your data such as files and folders on your PC to your Transcend USB flash Drive and Versa .Jet Flash and Transcend Elite Data Backup Tool can synchronize your own important data with one click .Jet Flash and Transcend Elite Data Backup Tool support Jet flash and any model of Transcend Pen drives . After you download the Transcend Elite tool , open it , then You will find alot of functions ,look to the previous picture ,Now click on Backup . Select The source of your data in the hard disk or in the Jet flash drive . 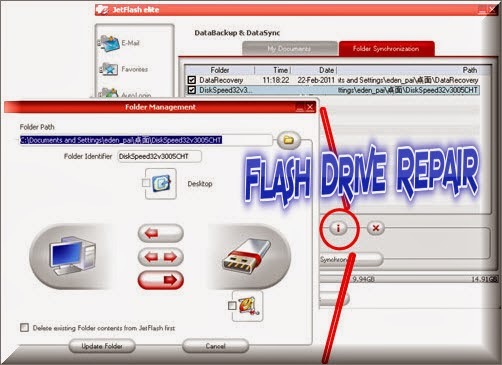 Click on Hard Disk icon or Jet Flash Drive icon to Show the data in it .Folder Synchronization tab allows you select any file or folders to update or synchronize data between the Hard disk and your Jet Flash Disk. To compress the documents in order to use the space on your Jet Flash drive more efficiently Just click on the “Data compression” check box (C-clamp image) in the “My Documents” or the “Folder Synchronization” tab . 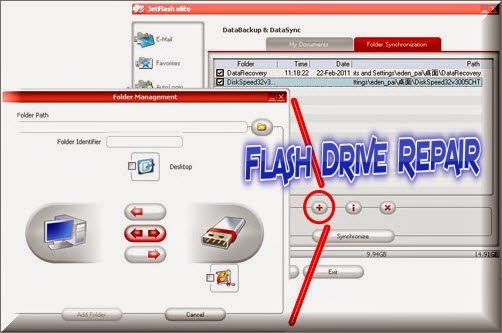 Jet Flash and Transcend Elite Data Backup Tool allows you create user-specified synchronization profiles so you can easily synchronize specific documents or folders between two or more PC's. 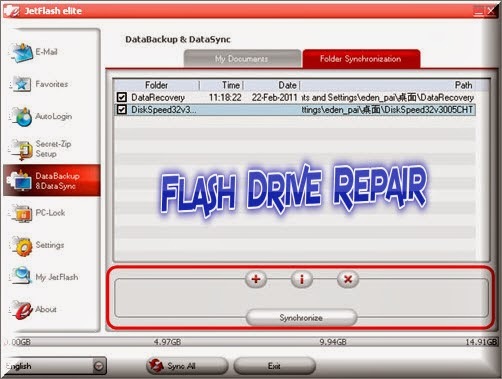 Open the “DataBackup & DataSync” window and click on the “Folder Synchronization” tab. To add a folder to the synchronization list, click the “+” button. If you want to edit the synchronization options for an existing preset folder, select the folder and click the “i” button. To delete the preset folder, click the “x” button. 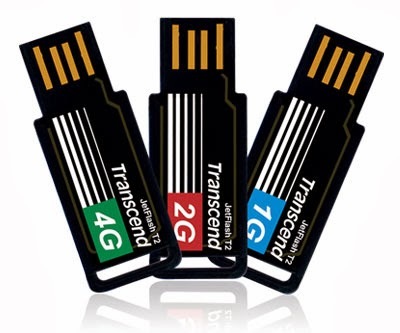 I hope you like this article , for more information , you can visit the official site of Jet Flash and Transcend Elite Data Backup Tool from here "Transcend Co" . Don't forget to subscribe to our mailing list or Facebook Page . 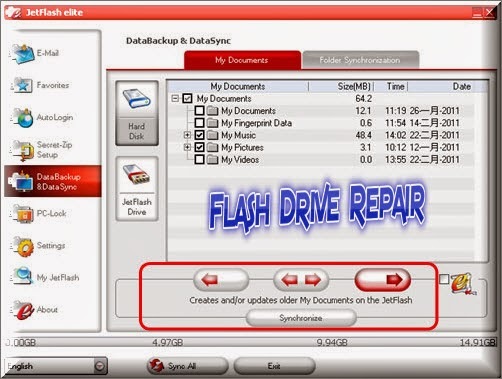 Now Download Jet Flash and Transcend Elite Data Backup Tool and enjoy .